In Darwin’s book On the Origin of Species, he mentions “survival of the fittest and competition” a few times, but mentions LOVE OVER 95 TIMES…. How did we allow a few men to fashion this world into the former ? Indoctrination is very powerful and in most cases harmful to our well being! “U.S. companies are buying back huge amounts of their own stock, and the ones executing the biggest buybacks are seeing their share prices rewarded handsomely. Companies in the Standard & Poor’s 500 Index purchased $128.2 billion of their own stock in the third quarter, according to S&P Dow Jones Indices, The Wall Street Journal reports. That represents the highest level since the fourth quarter of 2007. As for stock performance, the S&P 500 Buyback Index, which includes the 100 stocks with the highest buyback ratios, has soared 45 percent so far this year, outperforming the S&P 500’s 28 percent gain. The buyback ratio consists of the total cash paid for common stock during the past year divided by the market capitalization of the common stock. “The end of unemployment checks for more than a million people on Saturday is driving out-of-work Americans to consider selling cars, moving and taking minimum wage work after already slashing household budgets and pawning personal possessions to make ends meet. They’ve exhausted their state unemployment benefits and now that the federal extensions are gone, unless they find jobs the couple plans take their children out of their high school in January and relocate 50 miles east where a relative owns property so they can save on rent. “Home prices have zipped back into record territory in a handful of American cities, a milestone that comes seven years after the housing bust ravaged the market and the broader economy. Values are up more than 13% from their 2007 high in Oklahoma City and by more than 6% in the Denver metro area. Prices are back to all-time highs in 10 of the nation’s 50 largest metropolitan areas, according to a Wall Street Journal analysis of price data from Zillow, an online real-estate information service. Prices are within 5% of their previous peak in San Jose, Calif.; Nashville, Tenn.; and Dallas. Prices nationally remain below the highs of the past decade, and many of the cities that have seen the biggest gains largely escaped a boom and bust. Home prices in some parts of the country that did experience a bust have benefited from low supplies of homes for sale and historically low interest rates that have boosted prices—and sparked concerns that prices could again be overvalued. The figures aren’t adjusted for inflation, but experts say they underscore the uneven nature of the U.S. housing recovery. “The main story in a lot of these places is that they didn’t have much of a housing recession. It’s much easier to be back at peak levels when you didn’t have a big boom and bust,” said Stan Humphries, chief economist at Zillow. “MILAN (Reuters) – A delay to vital fundraising at Banca Monte dei Paschi di Siena<BMPS.MI> has increased the risk that Italy’s third-biggest bank has to be nationalized, a move the government would like to avoid. Shareholders led by the biggest investor in the bailed-out bank rejected plans for a 3 billion euro ($4 billion) share sale in January and postponed the capital raising until after May 12. The bank’s chairman and its chief executive may resign following the unprecedented clash with the main shareholder in the Siena-based lender, a charitable banking foundation with close ties to local politicians. The focus of attention now turns to Rome where both the economy ministry, which has oversight of banking foundations, and the Bank of Italy are closely following events. The world’s oldest bank needs to tap investors for cash to pay back 4.1 billion euros in state aid it received earlier this year and avert nationalization after being hammered by the euro zone debt crisis and loss-making derivatives trades. The capital increase is part of a tough restructuring plan agreed with the European Commission in order to receive clearance for the state bailout. “While the mainstream media continues to push the idea that we are facing an energy crisis due to a lack of resources, more people are actually looking into alternative energy and discovering that there really is no energy crisis at at all. We aren’t facing a lack of resources, we have multiple means to provide energy to billions of people without damaging the environment and diminishing resources. . These methods use very little input, and in some cases achieve infinite output. One of these ways to generate energy is through urine. It sounds a little nasty, but the story is quite remarkable. Approximately 1 year ago, a group of 14 year old’s from Lagos, Nigeria, developed a urine powered generator that can provide 6 hours of power on 1 liter of pee. It’s not uncommon for innovate energy ideas to come out of the third world, many of their problems stem from a lack of power, so some from that area are looking for ways to solve it with whatever they have. The hydrogen enters a water filter for purification, which then gets pushed into a gas cylinder. The gas cylinder pushes hydrogen into a cylinder of liquid borax, which is used to remove the moisture from the hydrogen. I found this document to be rather interesting. Anyone involved with banking, real estate, law, and the purchase of a home should consider the following information. Since i’m not an authority to give an opinion as to the validity or value of said information, it would be greatly appreciated that the readership offer any knowledge of the topic and or refer this to anyone they might know who could shine a light on these here matters. “WHERE DOES THE FRAUD BEGIN? facts, exhibits, law and is not mere opinion. is very obvious that this document is also a “Security Instrument”. disclosed to you at the “closing” in either verbal or written form? transaction at or near the time of closing? once it is in their possession? WHAT ACTUALLY HAPPENS TO THE “NOTE”? that happens with your “Mortgage Note” immediately after closing. of the people were collateral for the debt of the United States in the bankruptcy. discharge and have what we were entitled to after the bankruptcy. Why has this never been taught in the schools in this country? this entire country and in the world? can take full financial advantage of virtually the entire population. this be what has happened? In Fina Supply, Inc. v. Abilene Nat. Currently there are no comments from the administration despite…. “Fukushima Radiation Hits California’s Pacifica State Beach? “As the holiday spending season draws to a close, there has been a huge schism between hope and reality once again as captured by these two numbers: 3.9% and -3.5%. The first, aka hope, is how much the national retail federation predicted holiday sales would rise by at the start of the holiday season; the second, aka reality, is how much in-store retail sales declined by in the week before Christmas. So what is a despondent retail industry – which unlike the stock market can’t put off delivering results forever – to do? Why bet it all on a huge after-Christmas surge of course. Will 2014 Go Down as a First in the History Books for Upside Market Action? Thu Dec 26, 2013 8:52am EST Comments Off on Will 2014 Go Down as a First in the History Books for Upside Market Action? “Dow is up more than 5% five consecutive years now. A sixth such year has not happened before in history. 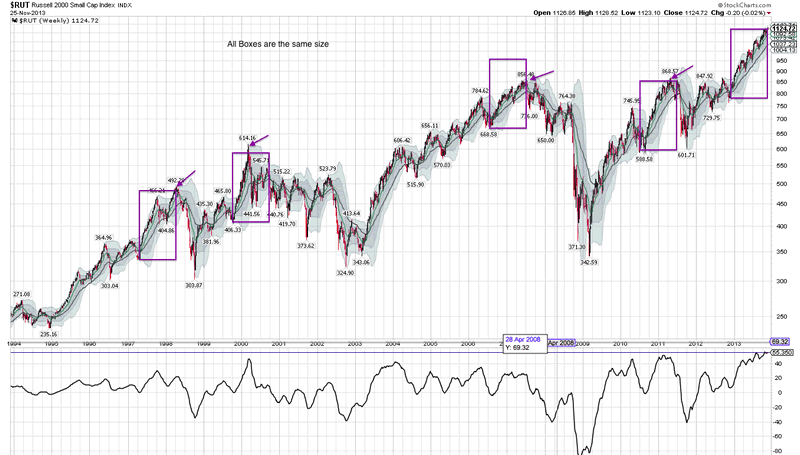 A 5-year bull trend only occurred once before, in the 1990s, and was followed by 3 down years. Russell 2k rallies of similar size and duration to 2013′s (excluding accelerations from major bear lows) are shown below. In each case all the gains were given back the following year. 2014 is the second year in the Presidential cycle, and is the weakest historically by returns, averaging flat. The logic for this is that is it a time for governments to deploy tougher, unpopular policies. The Investors Intelligence bull-bear ratio currently exceeding 40% also forecasts a flat return for the SP500 by the end of 2014, by averaging history, whilst the II bear percentage alone, around 15% the last 4 weeks, has historically produced returns of -5% to -20% over the next 6 months. The Citigroup Panic/Euphoria Model, having crossed the Euphoria threshold, predicts an 83% chance of losses in 2014. Goldman’s analysis of performance following a year of 25% gains or more point to a median drawdown of 11% in the next 12 months. Next is a chart highlighting a couple of previous occurrences similar to 2012 and 2013 where stock index rises were dominated by multiple expansion, not earnings growth. In both instances the following two years saw better earnings growth. But notably the next two years were 1987, stock market crash, and 1999, at the end of which the Dow peaked, suggesting a common theme of pre-correction exuberance. Both the following charts reveal that 10 year stock market returns are closely correlated to deviations from norms 10 years earlier. 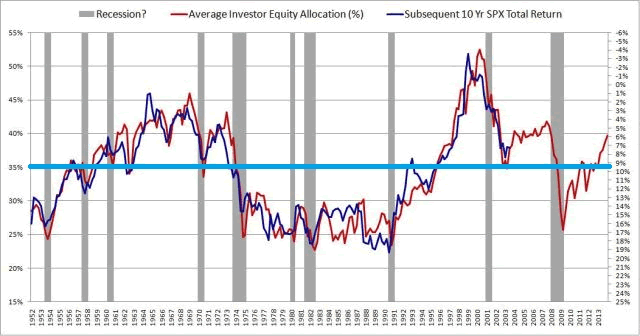 The first correlates average investor allocations and the second market cap to GDP. I have added the blue horiztonal line averages, revealing both are overvalued currently, but one more extreme than the other. 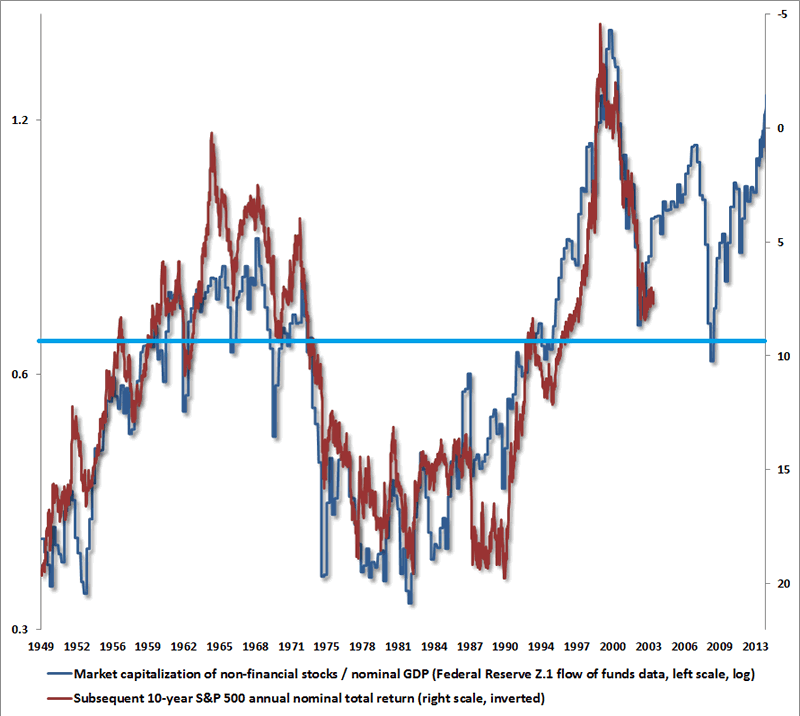 The logic behind both is that mean reversion always occurs. The bigger the deviation build the bigger the subsequent normalisation, as ‘this time is different’ each time is disproven. For US markets currently, we see the second highest market cap to GDP valuation outside of 2000, the 4th highest Q ratio valuation and 4th highest CAPE valuation in history. In all the other such historic outliers, a bear market followed to correct the extreme, there was no orderly consolidation of prices whilst the underlying fundamentals accelerated to catch up. ‘This time is different’ thinking argues that because the Fed has suppressed cash and bond yields, equities have to be revalued higher, so this valuation outlier doesn’t count, and there will be an orderly normalisation of valuation as earnings and GDP will accelerate and yields rise slowly, without any crash in equities. “Despite the Obama administration’s claims of economic growth, the truth is that in most states the private sector is shrinking and the public sector is expanding as a proportion of the workforce. In fact, say researchers Keith Hall and Robert Greene, since the beginning of the Great Recession, the private sector has shed jobs in almost every state, while the increase in taxpayer-funded employment has been masked by the use of contractors rather than outright employees.